Sometimes More Is LessEliminate The Muda! Welcome my friends to the first ever National Juicer to Juicer Challenge. As stupid as this post may sound there is a valuable lesson within. This blog began with a vision of taking a sound and well established business management approach and figuring out ways to apply it to one’s personal life; the business management philosophy of Lean. Ask a hundred people to define Lean and you’ll get 100 different answers. For all it’s good, it sure can be difficult to fully express what lean is. It’s often much easier to show Lean’s benefits, hence this post and juicers. One of the luxuries in life that I indulge in, is fresh squeezed orange juice. 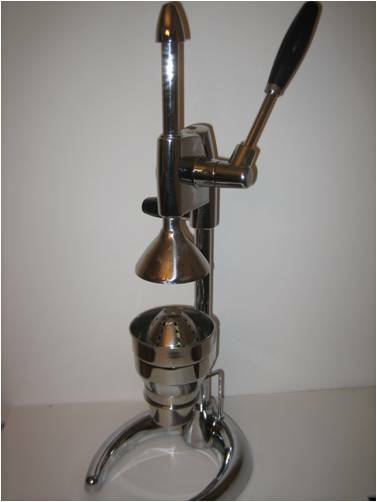 Over the years I have owned several different juicers but never did I have one as nice as the commercial press juicer (pictured above) that my mother gave me over five years ago. This article was featured in the Carnival of Personal Finance hosted by My Journey to Millions and the Festival of Frugality hosted by the Ultimate Money Blog. Please check out these carnivals for many other great articles about personal finance. 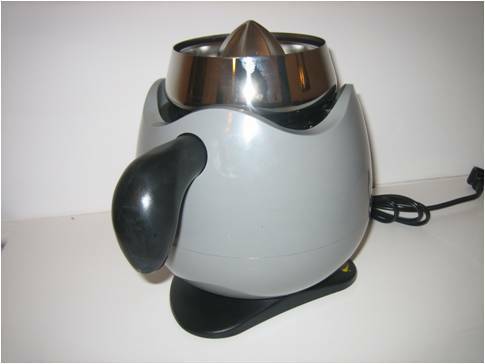 It’s been great, it works quickly and has provided gallons and gallons of juice. Sadly, its showing its age. It still works great but one of the legs has bent with years of use and it wobbles as a result. My wife surprised me today with a new juicer (bought with points, gotta love it!). This one, as you can see in the picture below, is a different design. It doesn’t press the oranges, it grinds them. Of course, I had to give the new juicer a spin and my wife just happened to have 28 pounds of oranges in the car waiting. 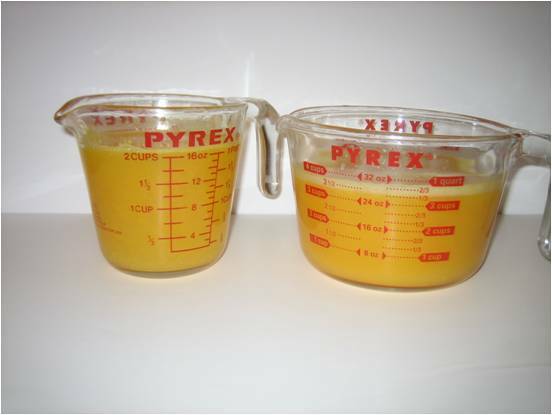 After the first bag of nine oranges I noted something odd; the measuring cup I habitually use for juicing was nearly full. Usually I need two bags of oranges to accomplish this. Ah, inspiration for a challenge! The old juicer came out; both were used to juice an equal 4lb (nine oranges) bag. The results were clear. The new juicer produced roughly 33% more juice from the same number of oranges. Two or three years ago, I may not have cared that much or really even considered the difference. After all, oranges were cheap and like most Americans I didn’t really think about the value of money. Lean and the understanding that a dollar saved is worth much more than a dollar earned has changed that for me! Cheap oranges are hard to find now. Florida was hit with a record breaking freeze last week. Citrus crops have been destroyed. As it was, the crop was due to be smaller than the year before and the market was anticipating higher prices. But because of the freeze, market prices were up 15 in just one week! At our local store oranges were priced at .59 cents each. My wife took a trip several miles away to the closest Aldi (my new favorite grocer!) and found oranges priced at $1.49 per 4lb. bag! Thanks to my wife’s effort, with 28 lbs. of oranges, taking the extra trip saved us $26.74. I love that woman! In the end, glass for glass, we got a lot more juice for less money per glass through a combination of a more efficient juicer and my wife’s effort to spend wisely. Now to be completely fair we should also factor in the cost of the equipment and labor time necessary. Coincidentally, pricing of the units is almost identical. While the exact press juicer couldn’t be located I found similar models for $95-$110. The electric juicer was $100-$114. Labor time was about 10% longer for the electric juicer but we are talking about less than 3 minutes per bag for 33% more delicious, refreshing and healthy juice. At it’s core Lean is about providing more value for less money, time, effort and energy. In this case, lean prevails… and I’m gettin some O.J. in the morning. Actually, I am getting more than usual!. This article was featured in the Carnival of Money Hacks hosted by the Ultimate Money Blog. Don’t miss the cute cartoons! Please check out this carnival for many other great articles about personal finance. I would love to be able to do the same thing with the other style of juicers. I bought one years ago for juicing vegetables and fruits and have always wondered how much better a newer one would be but am too cheap to buy one. Mine is messy and hard to clean but makes good juice but you have to wonder if Jack La Lanne’s is worth the money. Like most gadgets we never really consider the hidden costs and benefits. Great idea for an article. .-= David @ MBA briefs´s last blog ..How to analyze stocks like a pro – part 4 =-. Great perspective on how opportunities to save are often right in front of our face and we don’t even know it! .-= Saver´s last blog ..It’s not a bargain just because it’s cheap. If you don’t need it, don’t buy it. =-. I use 3 Valencia oranges to get around 200 ml-250 ml of orange juice goodness. It also depends on the orange you use, Valencia is rather juicy, while others with thicker skin have less juice in it. I’m not an orange expert, this is just what I notice from my past experience as an amateur orange presser. .-= Bytta @151 Days Off´s last blog ..Day 9: And the Award of “Miss Communication” Goes To… =-. You are taking the best approach possible by only making it as needed. This cuts down on the potential for waste and clean-up effort. Spot on with the variety of oranges as well! Festival of Frugality! | Ultimate Money Blog- Save Green and Live Green!